Mike has spent his life in the building trade and ran his own building company for nearly 25 years prior to starting the DIY Doctor website back in 1999. Having built numerous houses and fixed countless homes over the years, Mike is a true generalist and building technology specialist with a wealth of experience. He will be able to advise on most areas of general building, renovation and repairs, including planning budgeting and understanding the options that you have available to you. You might have seen Mike teaching Tiling, Plastering or Working with Builders and Tradesman at tradeshows where he presents the Tricks of the Trade Theatre. 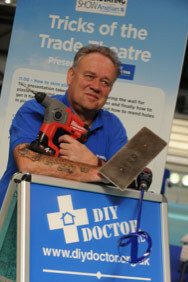 More about DIY Doctor at Trade Shows here. There is very little that Mike has not seen or had to deal with, formerly as his years as a builder and latterly helping and troubleshooting with DIY Doctor. Mike has a 1st class degree in Marketing (obtained part-time while continuing to run DIY Doctor) and is a published author. Master Basic DIY is now entering it’s 4th edition (and is available here). Interestingly, Master Basic DIY has also just been translated into Russian, which technically makes Mike an international author a fact that he is most proud of! He regularly contributes to DIY and home improvement columns in the national press. Mike is also a frequent radio and TV guest talking on subjects about home improvement, repairs and renovations. Mikes likes children, comedy or anything that makes him laugh, including his own golf swing. His favourite word is “carborundum” because it’s fun to say. However he avoids any form of decorating whenever possible because it’s messy and he’s not actually very good at it!